Variable thermal conductance can be achieved in a heat pipe by controlling liquid flow or vapor flow. A simple heat pipe design is proposed that varies thermal conductance by entrapment of liquid in a deformable section. The design is used primarily in the I-G environment. A prototype deformable body heat pipe was constructed and tested. The thermal conductance was varied from 0 to 15 watts. Thermal conductance was consistent at various settings and repeatability was maintained within plus or minus a half watt. Applications of this device in the thermal control environment from a solar storage are apparent. enters the evaporator, -vaporizes liquid and vapor is driven to the condenser. Normal heat pipe action commences. How- ever, if the heat pipe is tilted in the other direction, liquid flows to the condenser and if there is not sufficient capillary action to bring the liquid back to the evaporator, heat pipe action stops. Tilting angles between the on and off angles result in a modulation of thermal conductance. Figure lB shows the condenser blockage technique. A noncondensible gas is placed in the heat pipe and during heat pipe operation this gas is driven to the condenser. Variable conductance is achieved when this gas front expands or con- tracts, utilizing either heat or bellows, to block the con- denser. Evaporating vapor will not penetrate the gas front and therefore, heat rejection area is limited and thermal conductance decreases. Figure lC shows the vapor flow control device using a valve. This heat pipe is configured for holding evaporator temperature at a constant value. As the heat in the evaporator increases, the bimetallic spring opens the valve and vapor flows through the valve to the condenser. As the evaporator cools, the bimetallic spring changes the valve setting and modulates the vapor to hold the constant temperature. Another liquid flow control device utilizing an active pumping means is shown in Figure ID. Here liquid is pumped into the evaporator utilizing a bubble pump. The bubble pump can move large amounts of liquid and result in a wide range of thermal conductances. Power requirements for this device are on the order of 1% of the power transmitted by the heat pipe. Figure IE shows a liquid flow control device utilizing rotation. With the heat pipe in the position as shown, liquid is trapped in a U-tube. If the device is rotated 900 so that the U is not visible while viewing along the horizontal plane, liquid flows to the evaporator and heat pipe operation commences. Heat flow modulation in this device is achieved by various angles of rotation. Figure IF is the heat pipe design that is the subject of this paper. By bending the body of the heat pipe, liquid is trapped. Variable bends result in various amounts of liquid available to the evaporator. This paper presents data, analysis and application concerning this deformable heat pipe. Figure 2 depicts the concept of the variable conductance operation of the deformable body heat pipe. Figure 2A shows the heat pipe in the high rate of heat transfer operating mode. All liquid is in the evaporator being evaporated as or in the stage of drain back from the condenser. Multiple wicks are all wetted inside the evaporator. Figure 2B shows the modulating mode. By deforming the body at the location designated, a given amount of liquid is trapped in a reservoir. The reservoir is not sufficient to entrap all liquid, so some liquid does arrive at the evaporator. It should be noticed that the liquid reservoir now in the evaporator is lower and that some wicks are exposed and desaturated. This results in less liquid available in the evaporator and a more concentrated evaporating area. The result is more thermal constriction and loss of heat transfer rate. As we go to Figure 2C we see the deformable body device in the off position. The deformation is large enough such that all returning liquid is entrapped and no liquid is available for the evaporation. This is the off mode. is 3/8 inch in outside diameter. The body material was copper. The deformable section is made of flexible, stainless steel tubing. This was coupled to the heat pipe by typical pipe fittings. Normally, the body material would be welded into the heat pipe itself. Figure 3A is an overall view of the apparatus. As shown in Figure 3B the body can be deformed by a thumb screw moving the deformable portion of the heat pipe up and down. Various heat transfer rates are obtained by how much the thumb screw is turned to deform the heat pipe. Figure 3C shows the heat pipe in the on mode. A small nichrome wire wrap heater was placed at one end and thermocouples were mounted in the evaporator to determine temperature rise in the evaporator and gage the operation of the device. Methanol was used as the working fluid. Tests were run at various power levels and various periods of time. Thermal conductance was altered simply by turning the thumb screw. For a test period of approximately five hours, data was recorded on evaporator temperatures and heat transfer rates of the system. Figure 4 is an infrared photograph of the operation of the heat pipe. High temperatures are depicted as light areas. Figure 4A shows the heat pipe in the off mode. 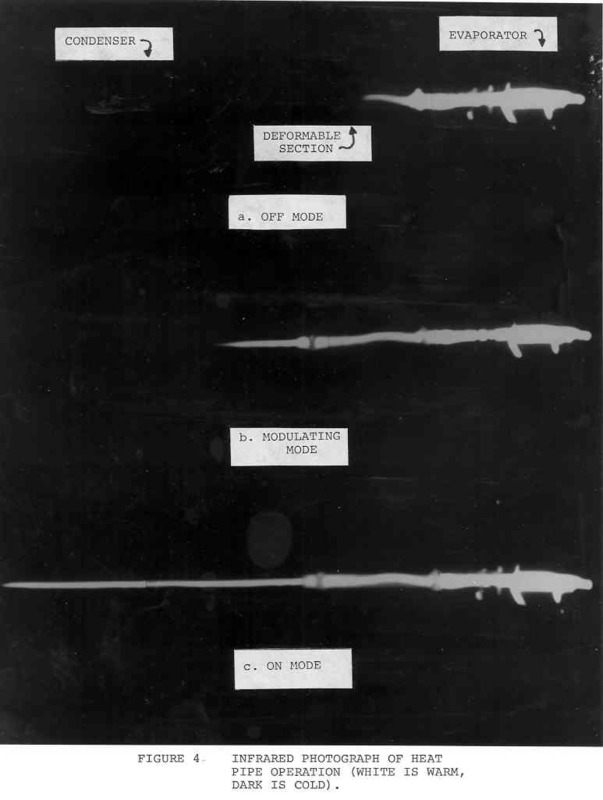 No vapor has penetrated beyond the deformable section. In Figure 4B the bend in the heat pipe is reduced and a small amount of liquid is released to the evaporator, resulting in vapor penetration into the condenser. This is the modulatory mode. Figure 4C is the full on mode and all liquid is available to the evaporator. Shown in Figure 5 are the results of this test. Early in the test phase the heat pipe was allowed to operate at full power, which was approximately 15.3 watts. Early into the test, at approximately 15 minutes, the heat pipe was turned off quickly and then turned on again. You could see the thermal spike going up to approximately 80 C. During this transient the heat pipe was turned on again totally and we could see the temperature and wattage coming back to approximately the same level, demonstrating the repeatability of this device. During the next test the heat pipe was turned off entirely and the temperature was allowed to rise until it stabilized, as shown at the zero watt reading. After five to six minutes of this mode the thumb screw was backed off to come to an intermediate heat transfer rate. This turned out to be approximately 7.8 watts. That temperature was held for a period of time and then the heat pipe was turned off again. Again the temperature rose until the zero watt reading was maintained. The repeatability appeared to be very good, considering the simplicity of the apparatus. Throughout the testing and flexing of the heat pipe, the deformable portion always came back to center. There was no apparent evidence of plastic deformation or fatigue. the deformable body heat pipe accordingly. The deformable body heat pipe is sensitive to tilting angles. Therefore, its best utilization is in a stationary environment, such as this solar heating system. Once installed, the plunger can be easily calibrated to the proper temperature by simply adjusting the plunger with respect to the bimetallic strip. As the air temperature inside the home increases, the bimetallic strip changes position, pointing to the 22C position. This results in a shut off of a significant amount of heat going to the house because the deformable body heat pipe is trapping liquid in the trap reservoir. As the temperature inside goes down, more liquid is released to the heat pipe and heat transfer increases. This is a simple feed back mechanism that requires no energy to operate. It is interesting that coupling a heat pipe solar collector and the deformable body heat pipe can achieve a very nearly passive system. No external energy is required for operating control systems. The performance of the deformable body variable conductance heat pipe has been demonstrated through a simple experimental apparatus. The device has potential in stationary systems, where passive variable conductance over wide temperature ranges are required. Coupling this device to a storage unit that is supplied by a heat pipe solar collector, one can achieve a very nearly passive solar heating system. Data shows the heat pipe to vary thermal conductance over a wide range of wattage with relatively little leakage in the off mode.
. 2. Heat Pipe Design Handbook, DRDN. SE-345T. 3. Roberts, Charles C., "A Variable Conductance Heat Pipe Using Bubble Pump Injection", 2nd International Heat Pipe Conference, Bologna, Italy.